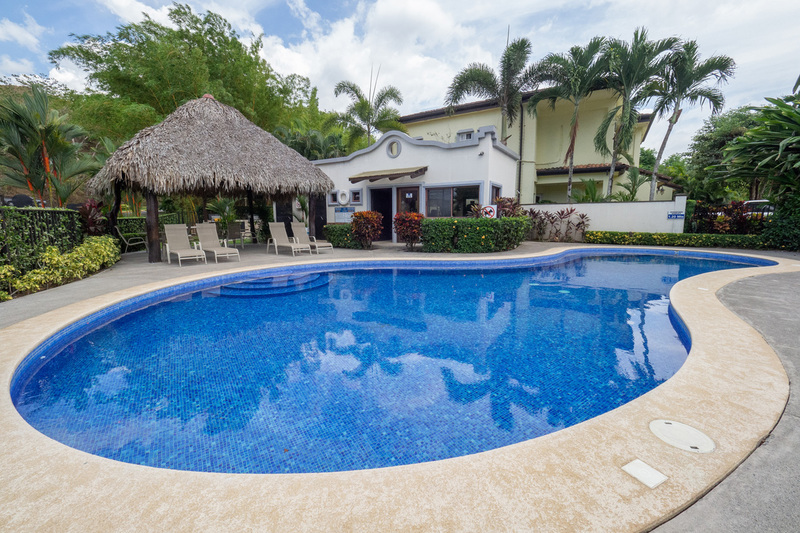 This great condo located at Las Nubes Herradura, is a fantastic option for families due to its family oriented environment with one of the best schools of the area within the premises Las Nubes School. Las Nubes Herradura provides an excellent location 10 minutes to Jaco beach downtown and all the services and conveniences of this beautiful surf town, also only 5 minutes to Herradura beach, supermarkets, Marina resort, shopping and restaurants, the property is also great option as a vacation rental investment with ROI. Beautiful common areas and grounds, BBQ place, nice pool, rancho, gym, Las Nubes is a pet friendly community, 24 hours security. The unit has a construction area of 160 m2 on a 220 m2 property, the unit counts with 3 bedrooms and 2.5 bathrooms on a 2 story building, spacious living room, nice size kitchen with wooden cabinets, terrace, laundry room, also a good size patio for your pet or kids, also great space for putting your own pool. excellent quality of construction, beautiful layout, very well maintained unit, covered garage + extra parking for an additional vehicle right out front and with a good location across from the pool. Find out more about our real estate opportunities and property management services for your investment in Costa Rica. Founder Operator of Costa Rica Holiday Rentals, leader vacation rental company and #1 tour operator in Jaco beach, 9 years of experience in the hospitality industry, Real Estate and property management. I am a very motivated person, entrepreneur always seeking..
Mar Arena Jaco Ocean View Condo for Sale Mar Arena Jaco, Ocean view penthouse with 2 bedrooms and 1 bathroom, .. Luxury Family House for Sale Jaco This charming family house for sale Jaco is located in a condominium complex, the ..
Breakwater Point Jaco Direct Oceanfront Condo 303 Breakwater Point Jaco is an absolute beachfront complex with 15 floor all units ..
Bahia Encantada Jaco Ocean View Condo – 3 Bedrooms Bahia Encantada Jaco is located on the north side of Jaco ..
Oceanfront Penthouse Jaco Diamante del Sol for Sale This 4 bedrooms, 4.5 bath Oceanfront Penthouse condo at Jaco Diamante del Sol .. Ocean View Penthouse – Sunset Boulevard Jaco Sunset Boulevard Jaco, luxury 3 bedroom, 3 full bath Penthouse located on the ..
Club del Mar Condos Jaco Club del Mar Condos & Resort are located on the the beautiful and preferred south end .. Ground floor Condo Bahia Azul 5A Fantastic Bahia Azul condos offers a great oceanfront location, tropically landscaped courtyard and beachfront pool, .. Fantastic ocean view house in Hermosa Fantastic Ocean view house Playa Hermosa This charming Ocean view house Playa Hermosa is made ..
Jaco Walk Shopping Center Jaco Walk Shopping Center Located on the center of Jaco beach is one of the most transited ..
Oceanfront Condos CROCS Resort Oceanfront Condos CROCS Resort Oceanfront 2 bedroom Condos at the luxurious CROC’S Casino Resort, These fully furnished ..
Macaws Ocean Club Jaco This luxury condo Macaws Ocean Club Jaco, is located on the second floor with its terrace overlooking ..
Foresta Residences Foresta Residences Jaco Foresta Residences Jaco, its innovative design embraces the aesthetic of its tranquil surroundings where Forest, ..
Beachfront condo for sale Acqua 406 This beautiful beachfront condo for sale Acqua is located on the 4th floor of ..